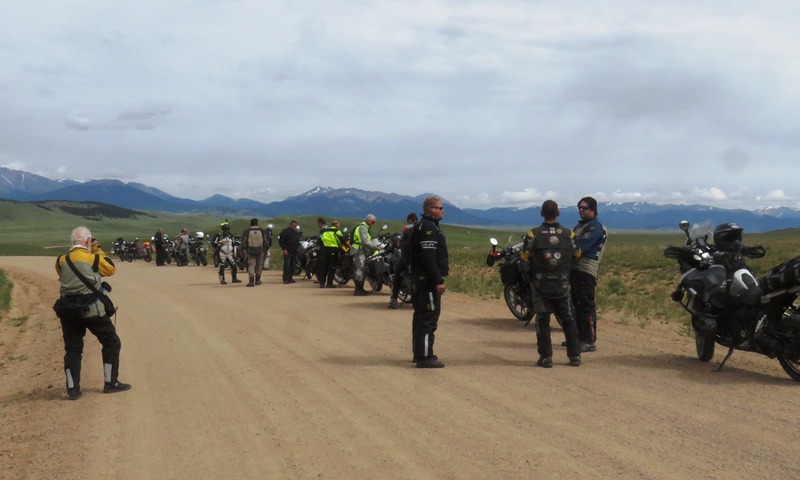 This article covers the two-day “High Rockies Adventure” (HRA) tour, two additional days of adventure riding following completion of the Intro to Adventure course at the RawHyde Adventure Camp near Hartsel, Colorado. 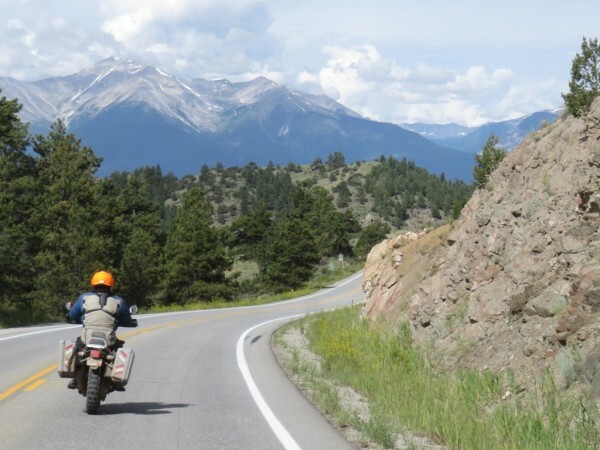 There is a separate article with the title “Adventure Motorcycle Training at RawHyde’s Colorado Camp” that I recommend reading first. 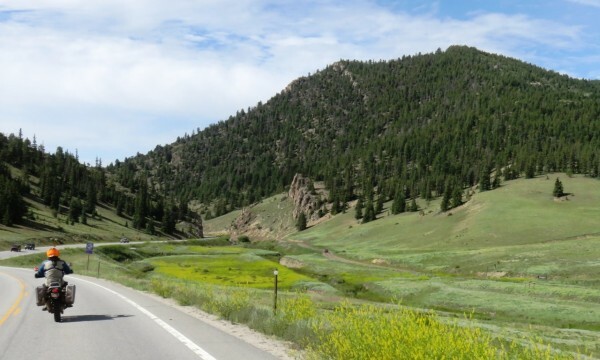 Since some of the HRA routes took us over several high passes that were former railway routes that no longer have any tracks, the grades were generally quite shallow. However, some routes were more challenging. 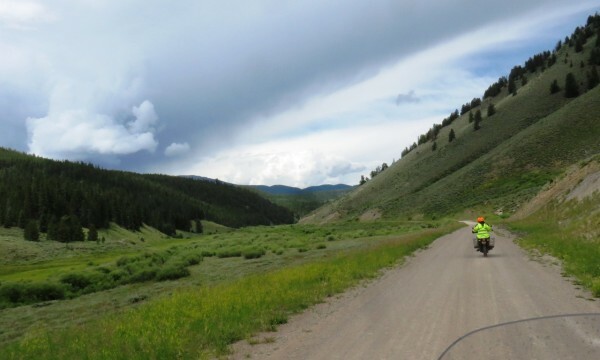 On the first day, Monday, July 13th, our ride leader, Michael, guided us over unpaved Boreas Pass, paved Hoosier Pass, and unpaved Weston Pass. These passes are located north of Hartsel. 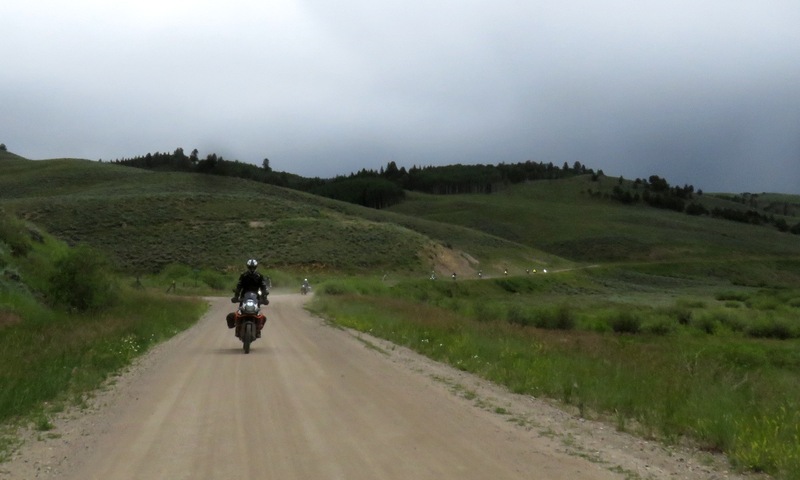 Although the weather was overcast or mostly cloudy, we all enjoyed our rides over these passes in remarkably dry road conditions and even under partly blue skies with some sunshine. The following map shows our route for the first day. Prior to departing from the RawHyde camp for the first ride, Michael, on the right wearing the blue & grey jacket in this photo, explained the rules and other important details about our excursion to our entire group of nearly 15 riders. As I managed to occupy the #2 position directly behind Michael, I was able to take several photos along our route with only him. Additionally I took several photos over my shoulder and at stops to show the other riders. 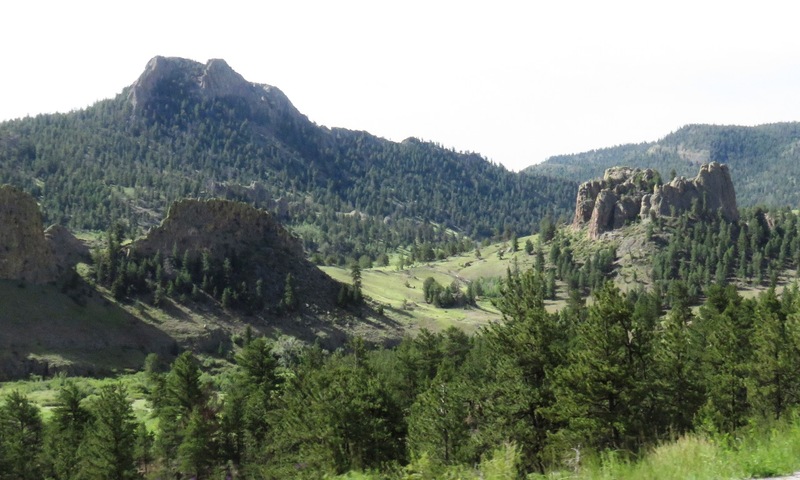 This first photo shows the view along CR-53 as we headed north towards Hartsel at 9 AM MDT. This next photo, taken over my shoulder about 30 minutes later, shows the view behind me. 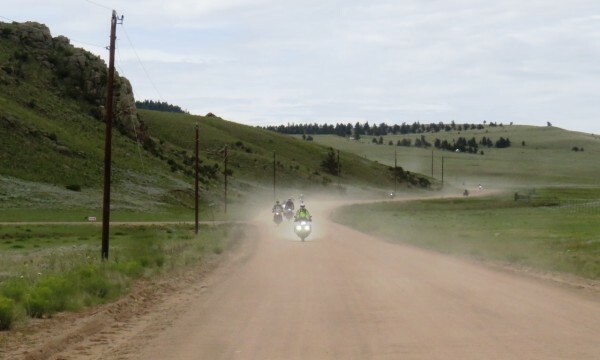 Thanks to the dry road conditions, our tires kicked up quite a bit of dust, causing us to spread out. Our first stop was at the solitary convenience store/gas station in Hartsel at 9:40 AM MDT. Upon leaving Hartsel, we rode eastward a short distance along US-24 to CR-15. At 10:18 we all stopped alongside the road for nearly 20 minutes to allow the photographers in the group to take some photos of the scenic view to the north. Upon reaching US-285, we turned left for 0.4 miles and continued north along CR-33 into the Pike National Forest, also called Boreas Pass Road. This took us through the small community of Como. 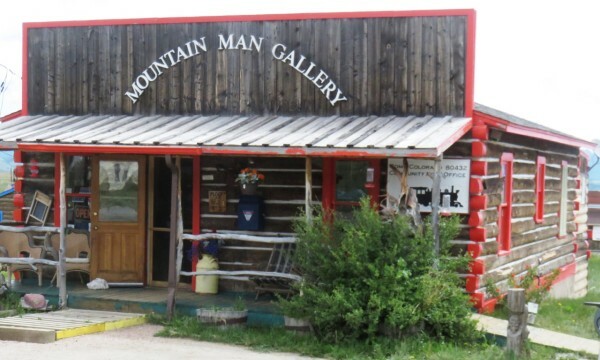 As we passed by one of the few businesses, I took this next photo of the Mountain Man Gallery, which also houses the Como Post Office. Just six minutes later we came to a fork in the road and paused to allow stragglers in our group to catch up and not miss the turn. Thirty minutes later we arrived at the Boreas Pass summit and stopped for us to take photos and chat about the ride thus far. After our half-hour break, we continued towards Breckenridge, which we reached by 12:30. 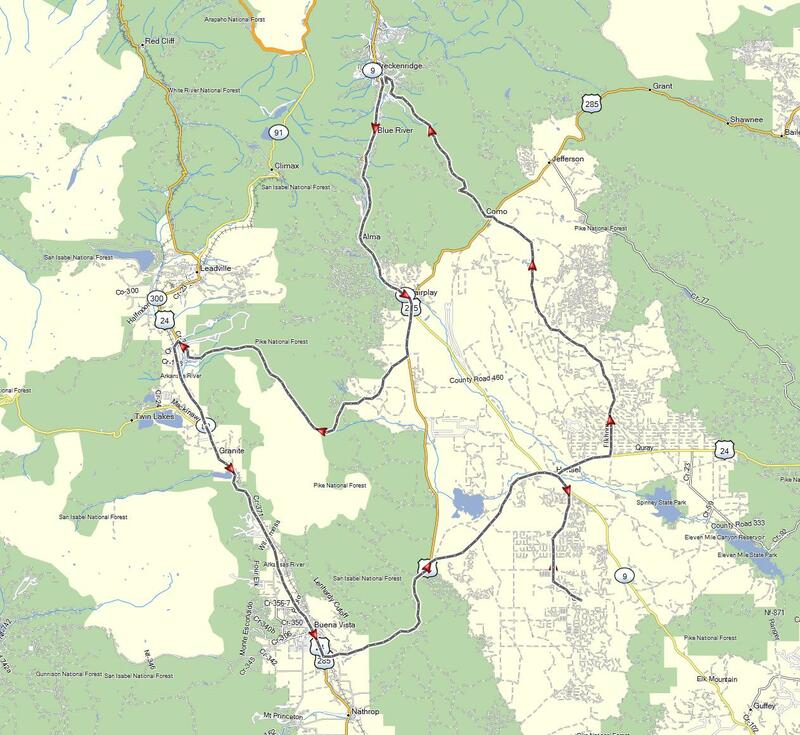 We did not stop there, but continued south along CO-9 towards Alma and Fairplay. 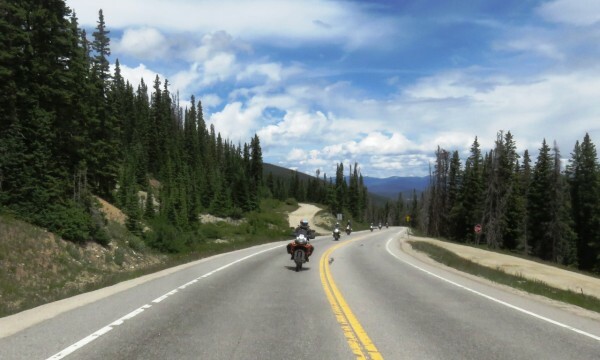 Just before reaching Hoosier Pass, I took this next photo over my shoulder. 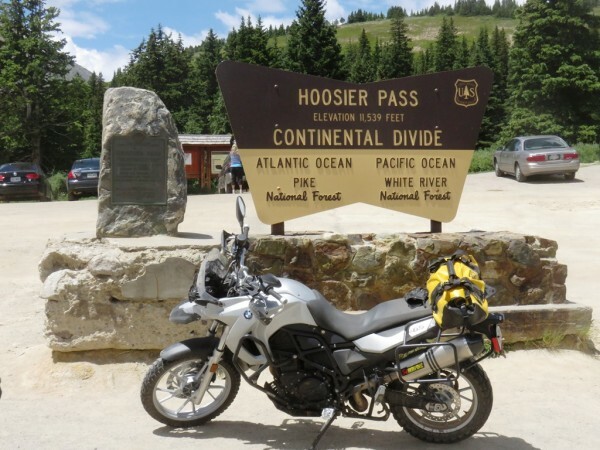 During our 8-minute stop at Hoosier Pass, I took this next photo of the sign, even though the motorcycle was not part of our group. Continuing south from Hoosier Pass, I took another photo over my shoulder. At Fairplay we followed US-285 south for nearly five miles to the turn-off onto CR-5 towards the southwest. 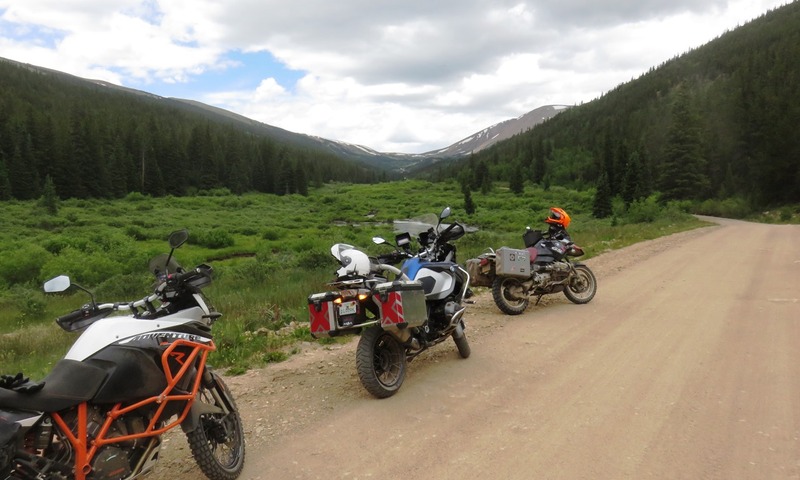 A short later we stopped alongside the South Fork South Platte River to take photos along the valley towards Weston Pass. 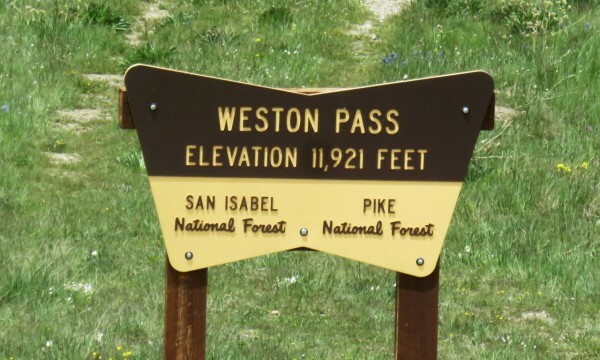 This next photo shows a telescopic view of the approach to Weston Pass. When we reached Weston Pass, we stopped for a group photo in front of the sign. 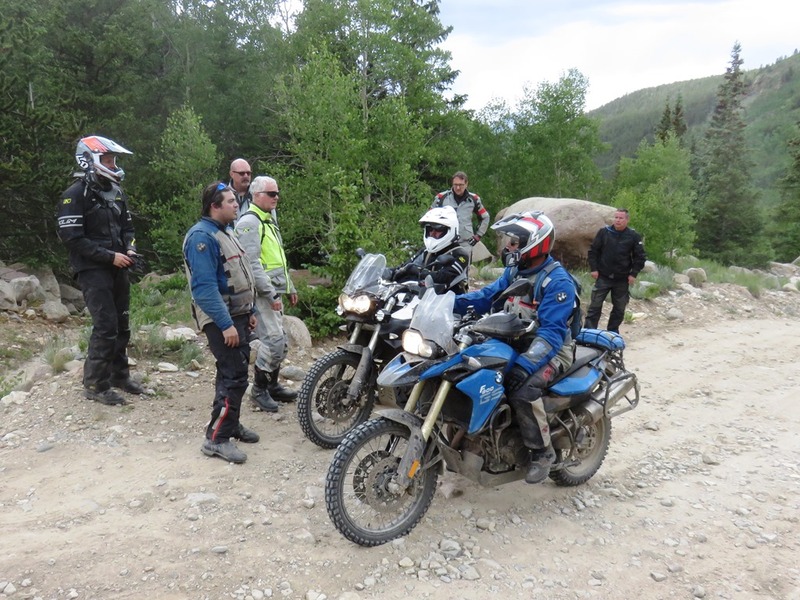 Just over three miles from the pass, we stopped along the road for a few minutes so that we could each evaluate the rocky road conditions on a steep downhill segment just ahead. While we were discussing the situation, two other riders approached from the other direction and stopped to answer questions from Michael. We each took a turn riding down the steep, rock-covered road. 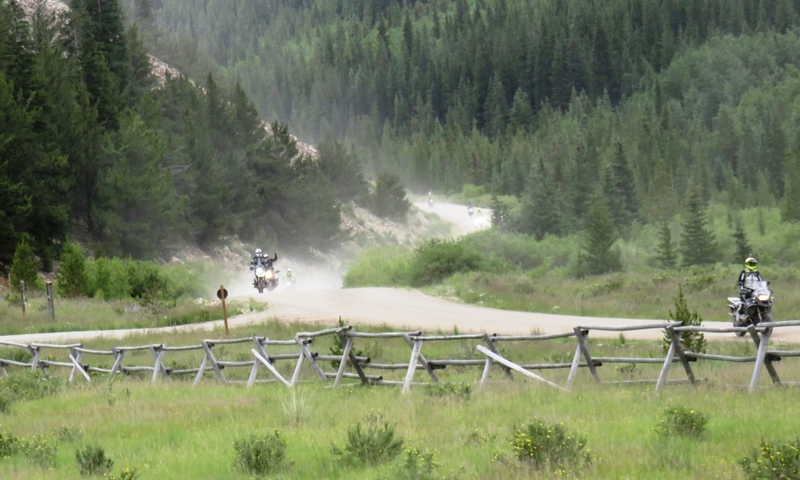 After reaching the bottom of the grade, I took this photo of another rider successfully negotiating the road. Michael was hurrying up the hill to assist another rider who had dropped his bike. 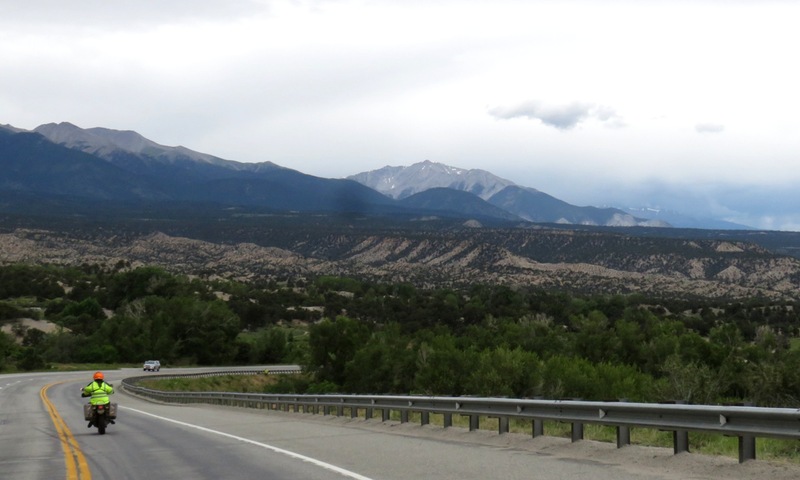 After we had all successfully traversed that challenging road, we arrived at the junction with US-24 and turned south towards Buena Vista. There we stopped for a few minutes break before returning to RawHyde’s camp. Over several beers and dinner, we discussed the day’s adventure and were all quite pleased with the experience. 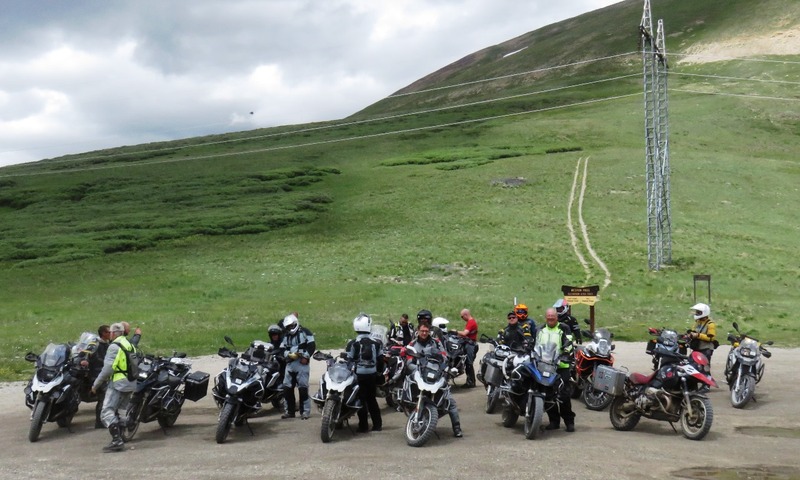 On the second day, the ride traversed the unpaved Marshall Pass and Old Monarch Pass, located to the southwest of Hartsel. Initially the weather was nice, partly cloudy and dry. 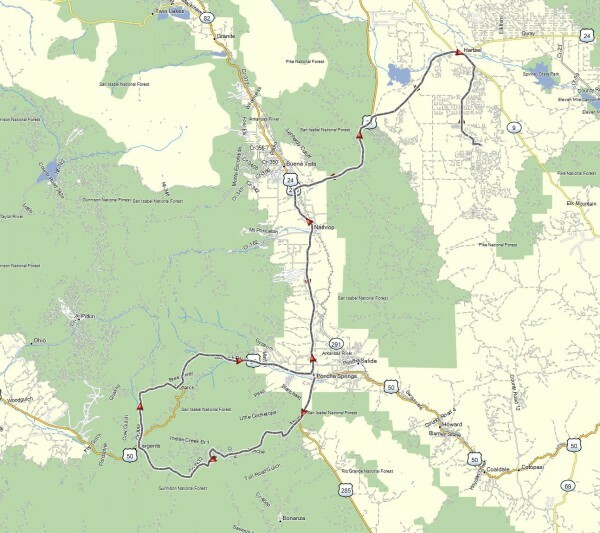 The following map shows our route for the second day. 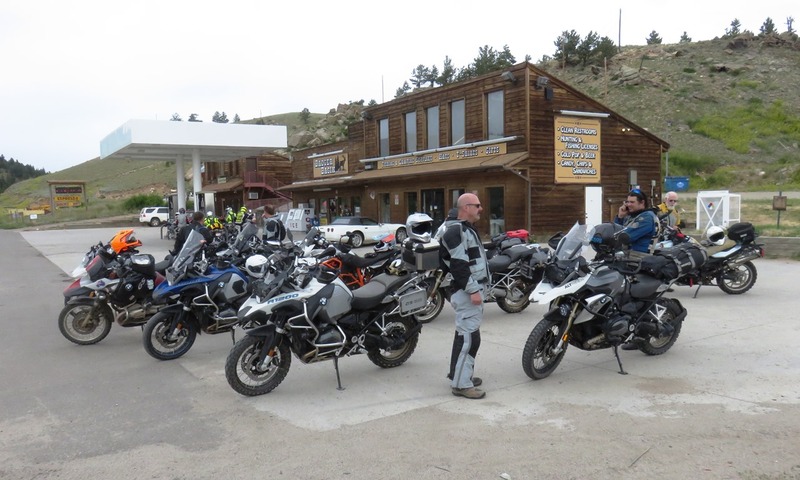 This day’s excursion started out at 8:38 AM MDT, just as on the day before, with a ride along CR-53 to CO-9 and Hartsel. However, since we had refueled the day before in Buena Vista, there was no need to do so in Hartsel. The first photo was taken along US-24 just west of CO-9 and shows the view westward. Once again I captured the #2 position directly behind the group leader, Michael. Here’s another over-the-shoulder photo taken a couple minutes later. 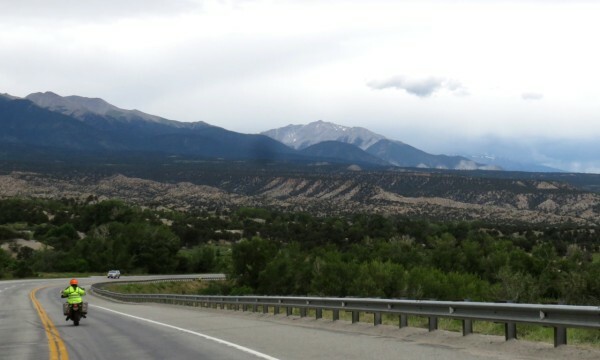 The highway passes through the San Isabel National Forest with very nice scenery. When we reached the junction with US-285 on the southern side of Buena Vista, we turned south towards Poncha Springs. At 10 AM and nearly halfway to Poncha Springs, I took three photos while riding along to create this next panoramic view of the scenery ahead. Coming into Poncha Springs shortly after 10 AM, we stopped at a convenience store/gas station for nearly 20 minutes. 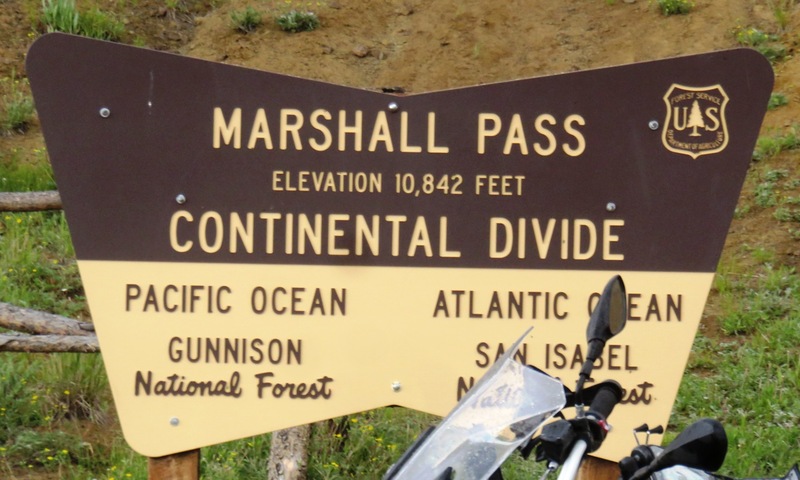 Continuing south on US-285 for just over five miles, we turned off onto CR-200, a very twisty unpaved road to Marshall Pass. 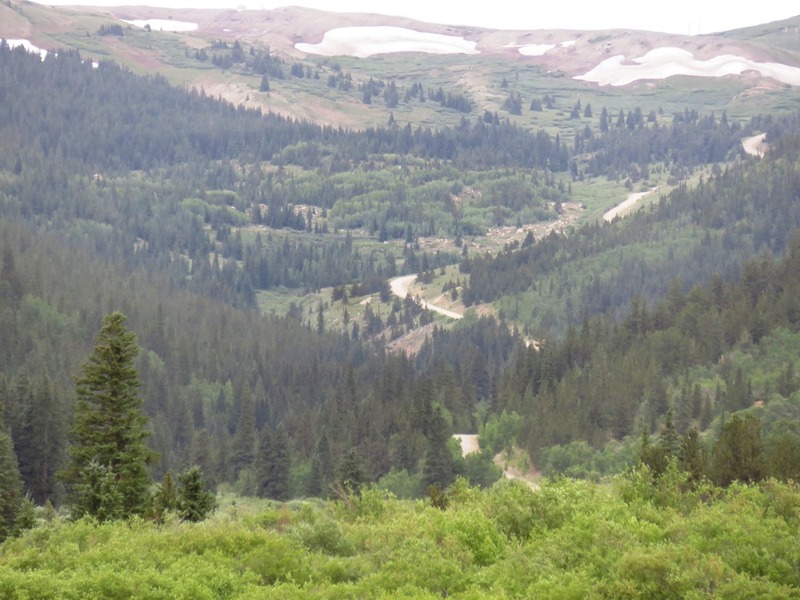 At 11:15 AM MDT, we arrived at the summit of the pass and I took several photos. Following our five-minute stop there, we continued along the same county road, now keeping an eye on the darkening clouds ahead of us. At a point just five miles until reaching US-50, I took these next two photos ahead and behind me. 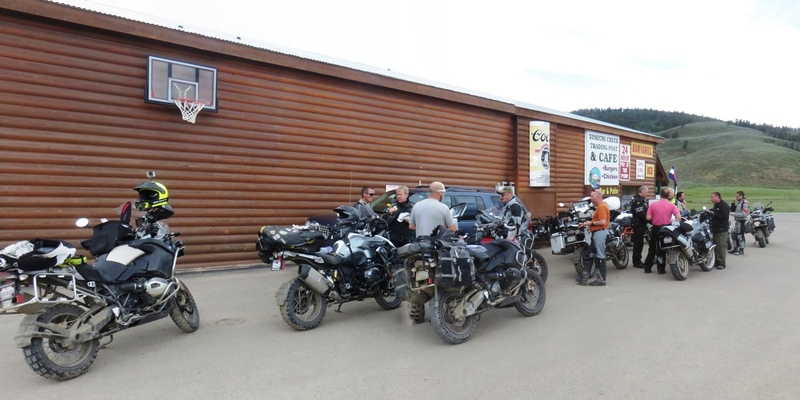 Just around noon we arrived at US-50 and we stopped at the Tomichi Creek Trading Post & Café for another break for nearly 35 minutes. After resuming our ride, we headed north a very short distance along US-50 before turning off onto the CR-888, which follows Tomichi Creek. 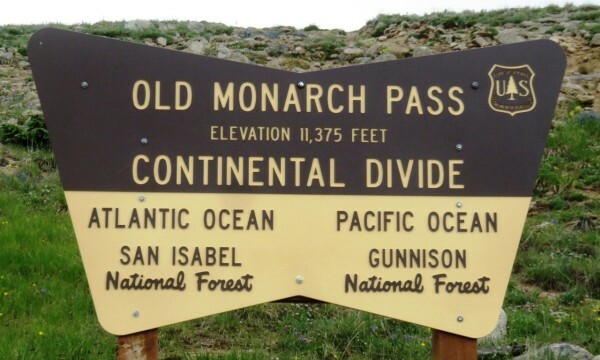 When we reached NF-237, we turned eastward to traverse Old Monarch Pass. 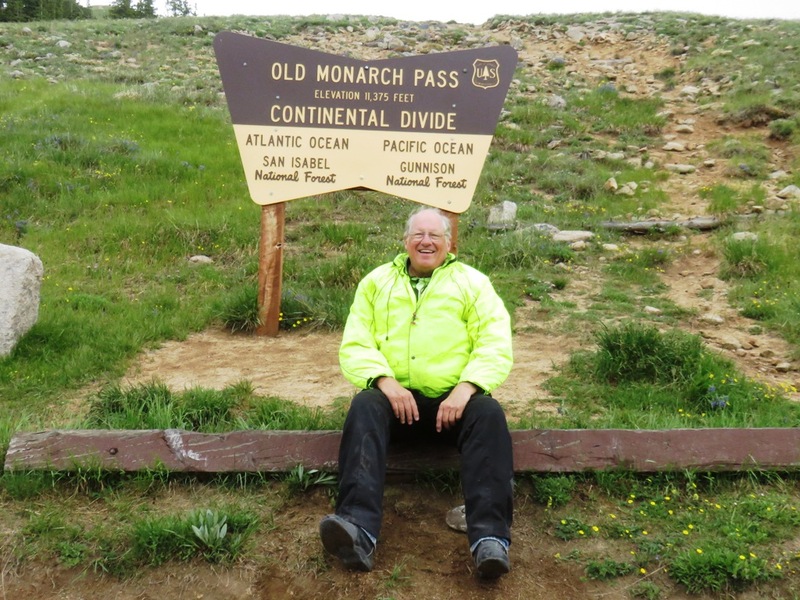 Due to the threatening rain, I kept my camera inside my jacket until we reached the summit of the pass at 1:13 PM. Again we took a break for nearly 15 minutes enjoy the scenery. One of RawHyde’s trainers decided to lay down and rest for a while. 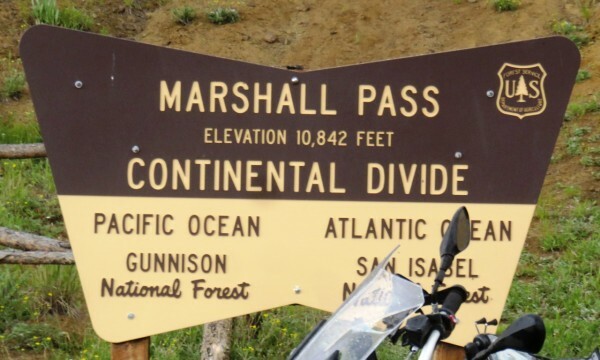 Another rider took this photo of me in front of the sign for the pass. Nearby I noticed a Forest Service warning sign and took this photo of it. Following our break, we continued down the eastern grade of the pass until we rejoined US-50. Since it was starting to drizzle lightly, I again secured the camera inside my jacket and took no further photos for a while. 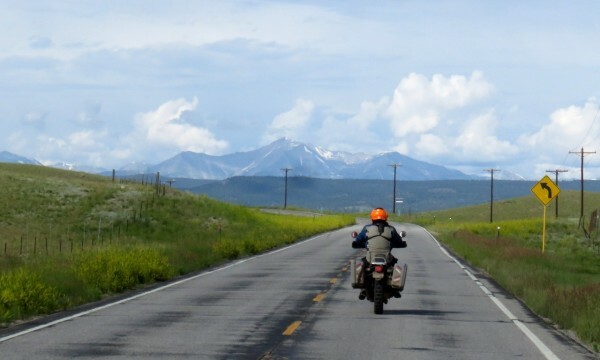 After we headed north along US-285 from Poncha Springs, I took this final photo. As we reached Hartsel on the return trip to RawHyde’s camp in the afternoon, the clouds did more than just threaten rain. We stopped at the convenience store for nearly a half hour in the hope that the rain would let up, which it eventually did. As we later discovered, back at RawHyde’s camp, a rain cell had been stationary over the area south of Hartsel and had rained intensively for quite a while. We found very muddy road conditions along CR-53 and especially slick conditions on the side road leading into the camp’s location. When the rider in front of me suddenly slowed down, I was unable to maintain momentum and became the only rider to fall over into the mud on that final stretch. 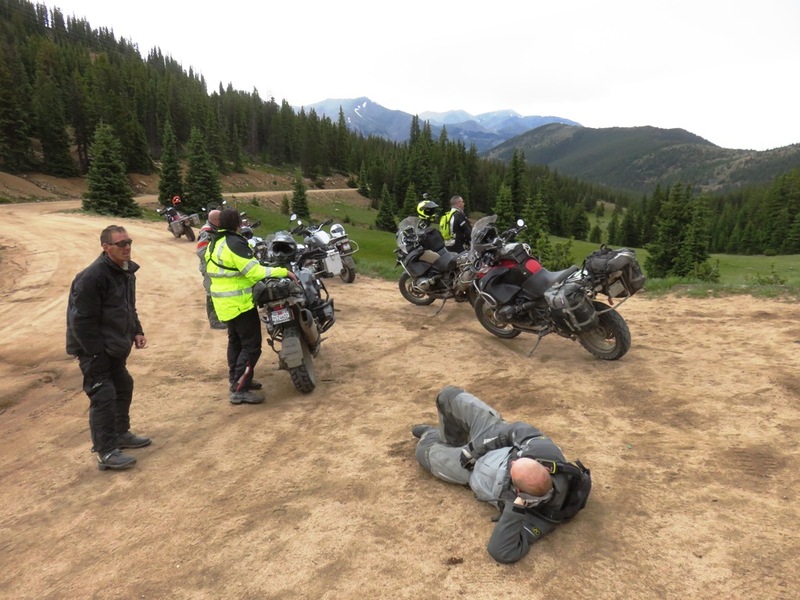 If my bike had had proper 50/50 knobby tires instead of the 90/10 Anakee-3s, I probably would not have had this tip-over. Thankfully I had plenty of help from both trainers and other trainees in picking up my motorcycle again. 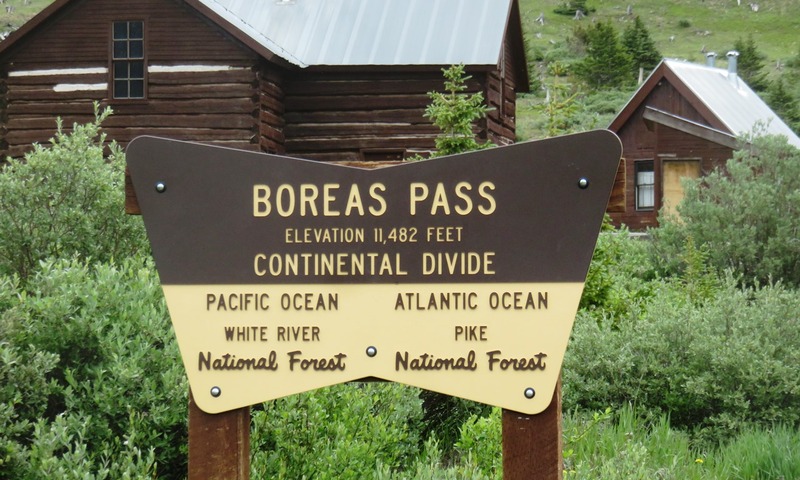 Even so, I felt exhausted, which was presumably aggravated by the high elevation. 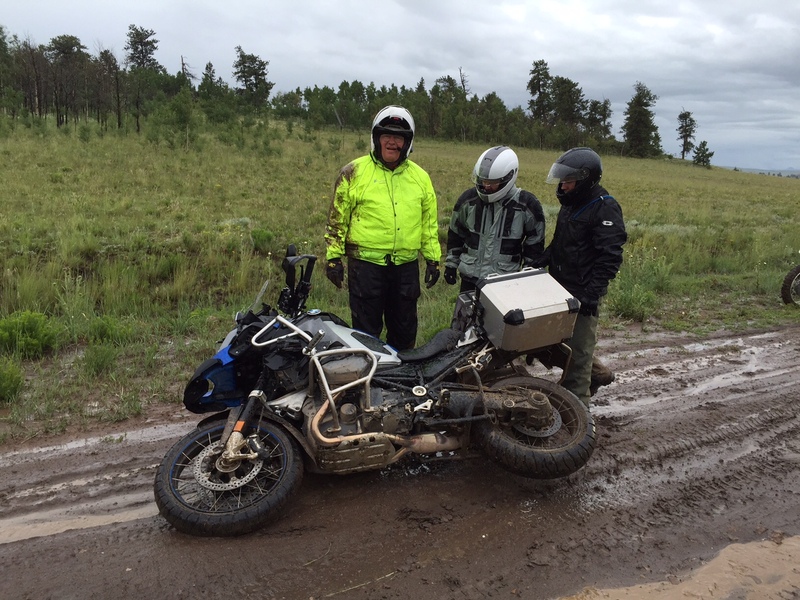 The bike was undamaged and the mud was easily cleaned off when I reached a car wash facility in Buena Vista the next day. My thanks to fellow trainee Jason Alderson for capturing the moment on his cellphone. We had a nice evening and another good dinner back at camp. The other fellows enjoyed watching my slide show of the photos from the entire weekend. 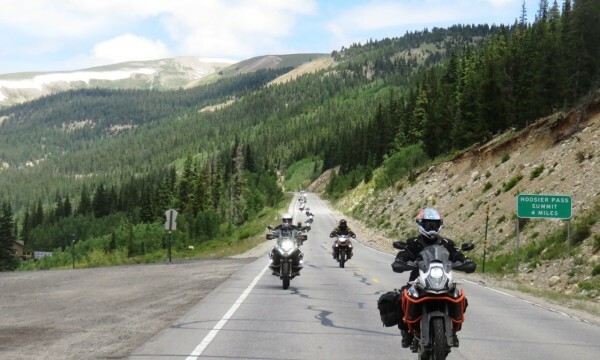 That was the final day of our High Rockies Adventure rides. The next day we all departed to our various destinations. 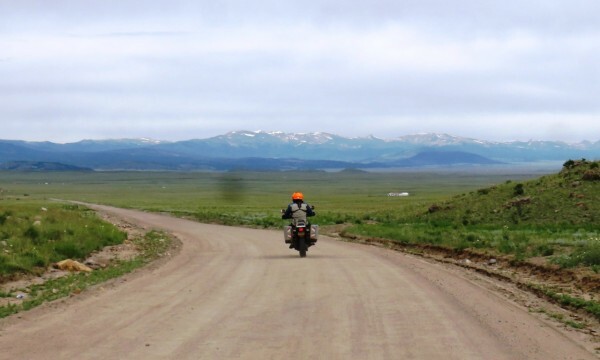 I look forward to returning to the West and riding other challenging routes as part of the Backcountry Discovery Routes, after I take RawHyde’s advanced rider course, called the Next Step. 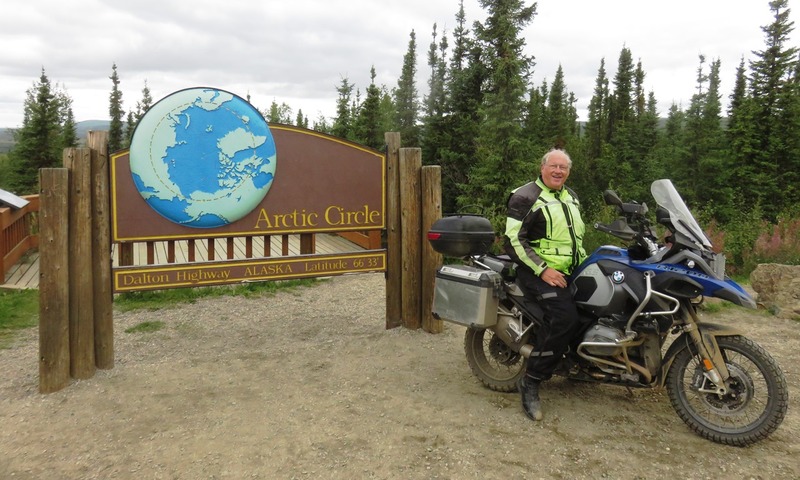 My summer tour continued and included riding from Washington through British Columbia and Yukon Territory into Alaska. Although I had decided not to venture all the way to Prudhoe Bay, I did ride up the Dalton Highway, along with three guys from Calgary, as far as the Arctic Circle where this photo was taken. Cloudy, dry weather made the trip quite pleasant. 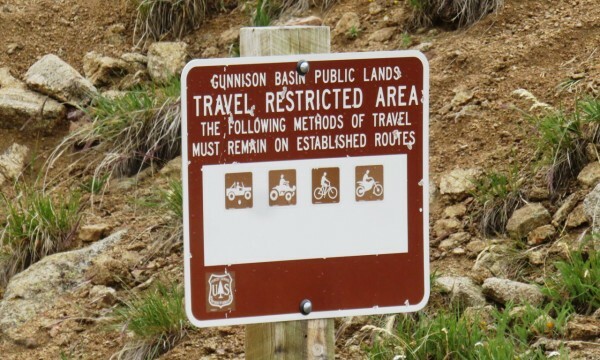 My training in the RawHyde course proved very useful in coping with the various unpaved roads on the way there, around Alaska, and coming back. Before leaving the US, I remembered my muddy lesson and mounted better tires. In this case it was a new set of Heidenau K60 Scout 50/50 tires that had just come on the market in the correct sizes for my 2015 BMW R1200GSA. 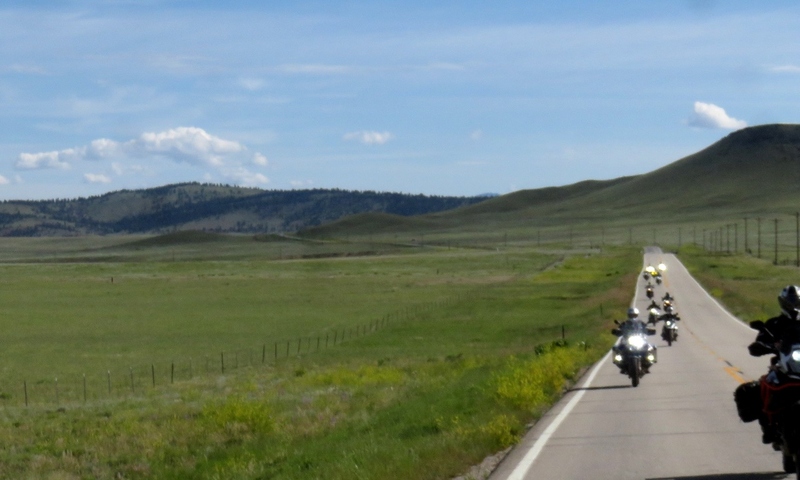 By the time I returned to Washington nearly 6,000 miles later, I had nearly worn out the rear tire. Thankfully, not another tip-over during that entire trip despite the various muddy, rocky, and sandy road conditions that I encountered. 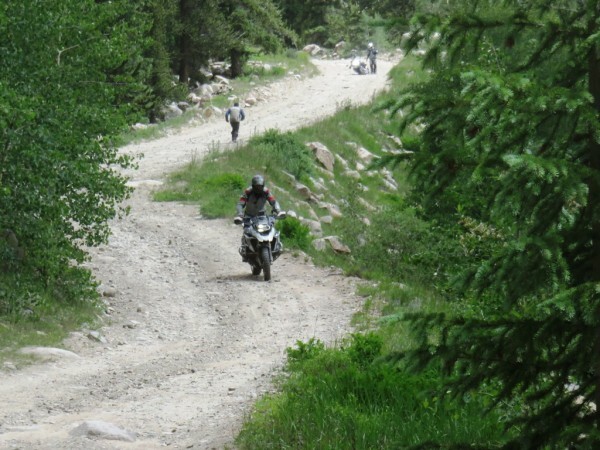 Adventure-riding can be both fun and challenging. 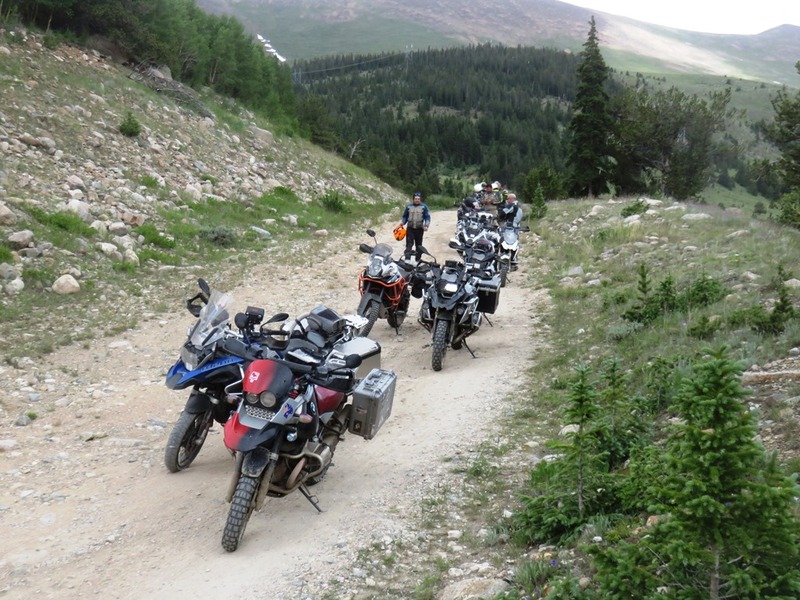 Due to the potential hazards or possible mechanical issues, I prefer to be prudent on such backcountry adventures and to ride only in a group.